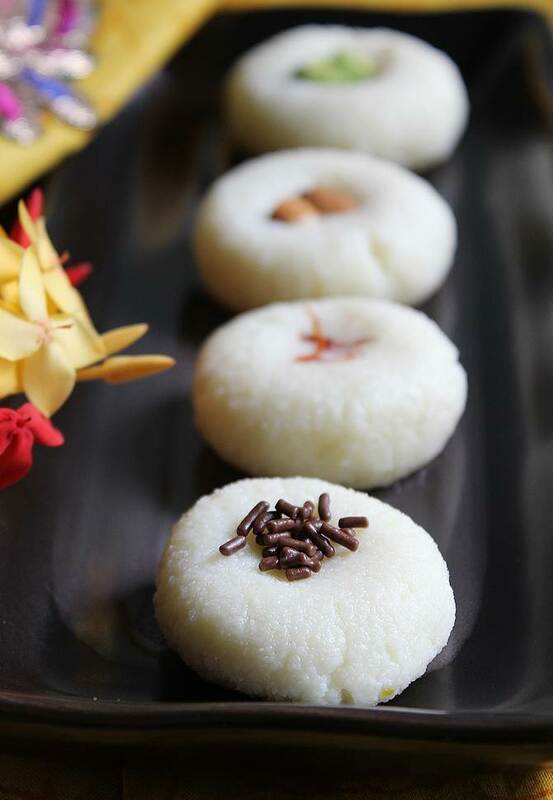 Sandesh recipe – sondesh is a delicious bengali sweet, popular all over India and abroad. It is often made for festive and special occasions, more importantly for Durga puja during Navratri. 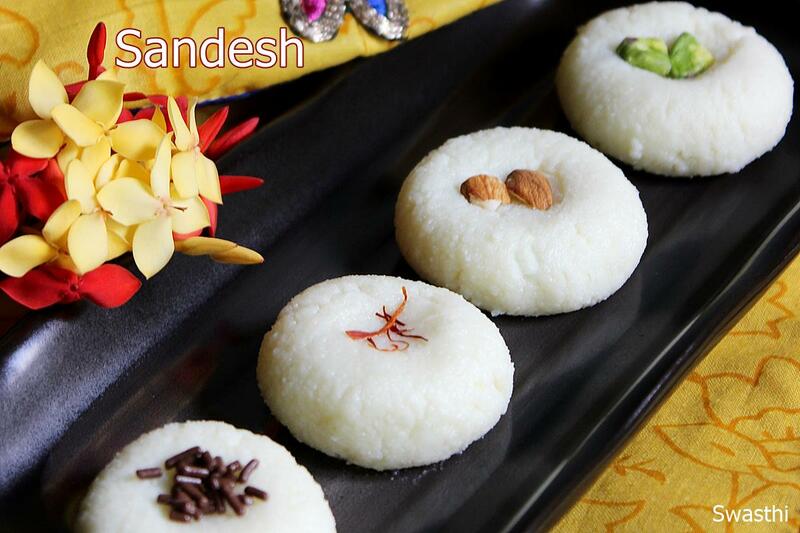 There are so many variations of making sandesh recipe. All are quite simple as much as just kneading up the three basic ingredients sugar, chena (paneer) and cardamom powder. Refrigerate for few hours and enjoy it. 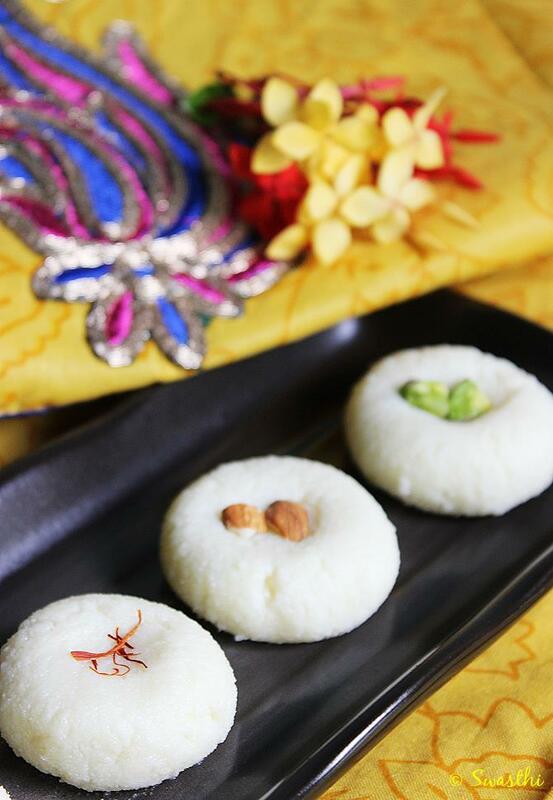 To make sandesh, it is always good to use fresh chena or paneer that is still moist. Instead of sugar, even palm jaggery or a mix of sugar and palm jaggery are used. You can make these cheesy delights more attractive by decorating with whatever you like. Decorate with Choco chips or Choco sprinkles. Nutty decoration using pista and badam. You can even garnish with Tutti Frutti. Apart from the 3 main ingredients, I haven’t used anything else to make this. You can add 1 tsp. pista almond powder to the mix while kneading, however the color of the sandesh turns pale if added. 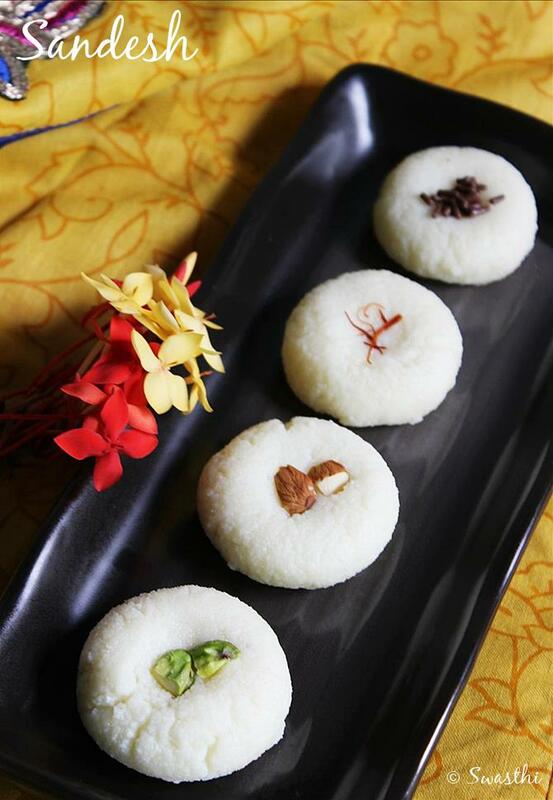 Popular bengali sweet, Sandesh made using paneer and powdered sugar. 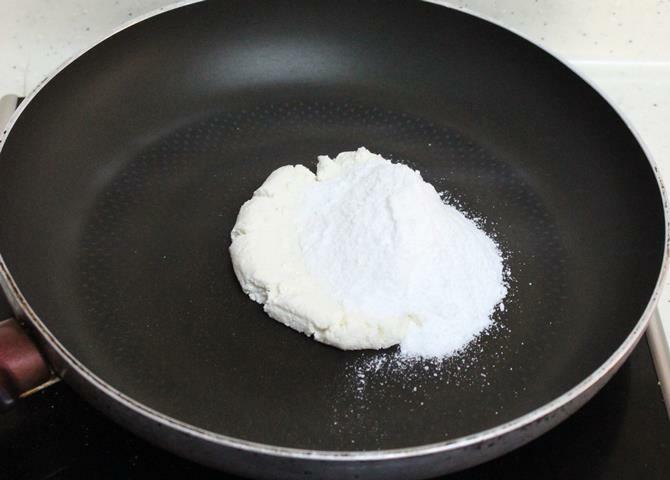 To a nonstick pan, add moist paneer, powdered sugar and rose water or cardamom powder . Mix well and cook on a low flame. The mixture melts off and becomes gooey. Cook until you get a thick consistency. The mix leaves the sides of the pan. Cool down, Knead lightly. Roll to balls and flatten slightly. Pista or almond flour can be added while kneading. Garnish with nuts or saffron. 1. 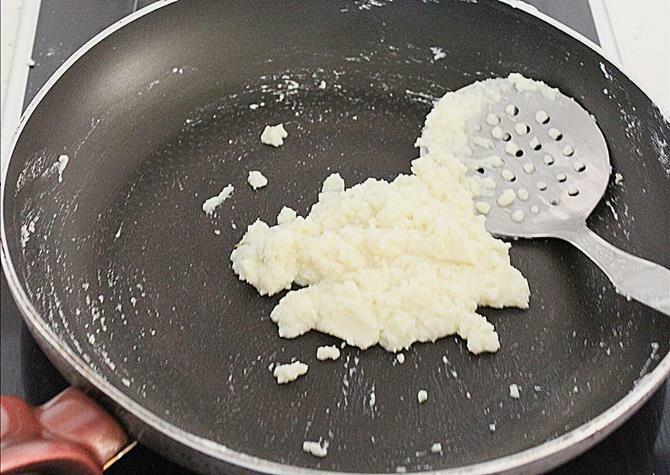 If you are a beginner or making paneer the first time, then read this detailed post on how to make soft paneer. However I am also sharing briefly here. 2. Bring 3 cups full fat milk to a boil. 3. 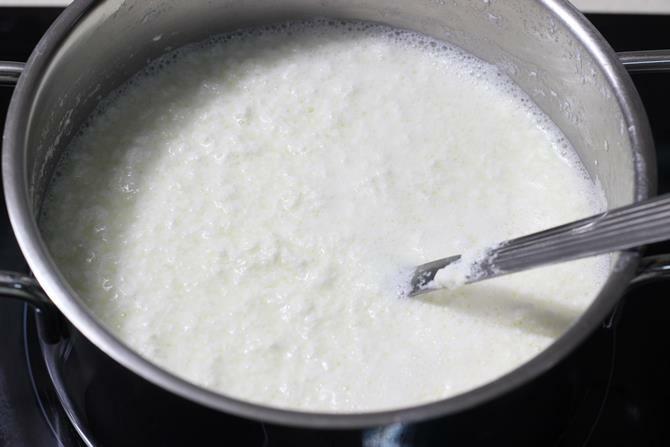 Add 4 to 5 tbsp curd or lemon juice diluted with water to the milk. Stir well. When you see the milk begins to curdle, switch off the heat. Make sure it is curdled well. Allow to settle just for a minute. 4. Place a muslin cloth on a colander. Drain off the paneer. If you have used lemon juice, Rinse the paneer under running water. 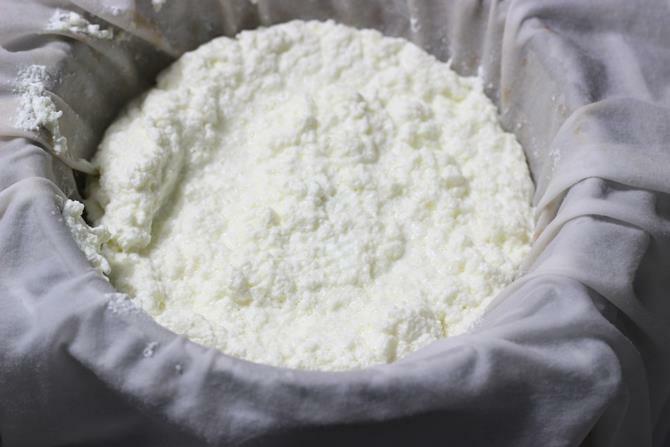 If you have used curd, you can just skip rinsing. 5. Squeeze off the excess water from paneer. 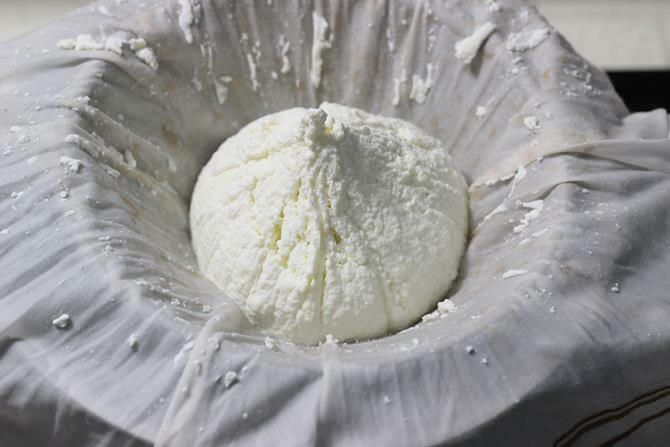 Make a knot of the cloth, hang it for sometime to drain up excess dripping whey. We just need moist paneer, so make sure there is no dripping whey or water from paneer otherwise sandesh will turn grainy. 7. Sugar melts and becomes gooey. Continue to cook on a low heat till it reaches a thick consistency. It also begins to leave the sides and looks crumbly. 8. When it cools down, Knead lightly. If you desire to add pista almond flour , you can add. Knead it till everything blends well. I haven’t added any thing. 9. Roll them to balls and flatten a bit. Tuck whatever you wish to garnish in the centre. Refrigerate for 2 hours and serve. Tuck in Nuts or few strands of Kesar for a traditional look. You are welcome. Good luck to you and Happy birthday wishes to your Dad. Thanks for sharing your joy. The recipe was very good! It was especially helpful due to the step by step pictures provided and to-the-point instructions for something that’s tricky like sandesh ! Thanks so much! Made it for my dad’s birthday! He was born and raised in Kolkata so wish me luck ! I hope he likes it ! Happy to read your comment. So glad to know the recipes are helpful. Thanks a lot for suggesting this blog and more importantly your wishes. They mean a lot! So happy to read your comment. it is not recommended to cook for long. But to tell the exact time it is not possible and is not apt to follow the time since that depends on the pan used, the flame and other things. Just when the mixture comes together it has to be removed. Cooking for any longer makes the chenna really hard, chewy and rubbery. The more moisture in the mixture the longer it cooks, so more sugar , more longer it cooks and turns chewy. Just switch off when the mixture comes together. I dont think i over cooked chena b cos i made ras malai n rasgulla sweets of urs n they tasted superb. Do u think its bcos of adding less sugar it dint turn gooey. I guess the chenna was overcooked while curdling. I usually switch off the stove as soon as i see the milk begins to curdle. This is the stage at which it may get overcooked and turn grainy or hard. These days some brands of sugar are very peculiar, While I was working on a different recipe recently, I too found that sugar did not melt until I added few drops of water. I guess organic sugar could be the cause. However to fix, put the mixture in a blender and pulse a few times. I am sure it will come together. 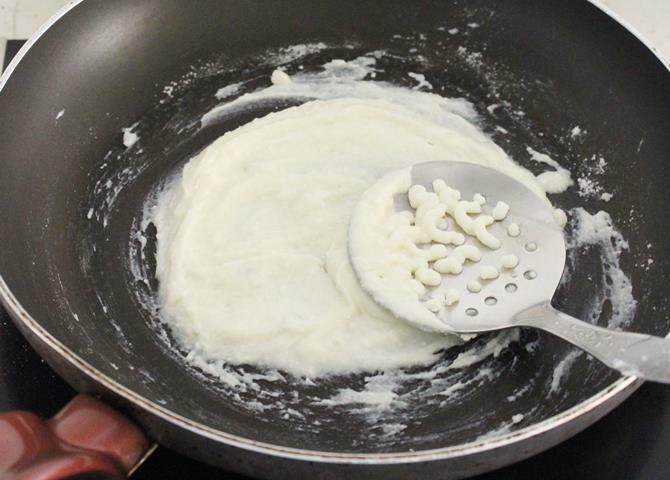 In case it turns sticky, then add few tbsps of milk powder. I am looking for a recipe to surprise my wife (she’s from Gujarat) by making her some sweets for Diwali. Can cottage cheese be substituted for the paneer? Not sure if it tastes good. You may like to try these quick and delicious coconut ladoo or coconut burfi. Hope this helps. I have kept the sandesh in fridge. But it looks hard. What mistake did I make. I also libe in Sgp. 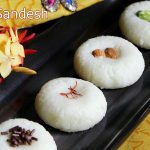 I love Sandesh and this recipe looks very easy. 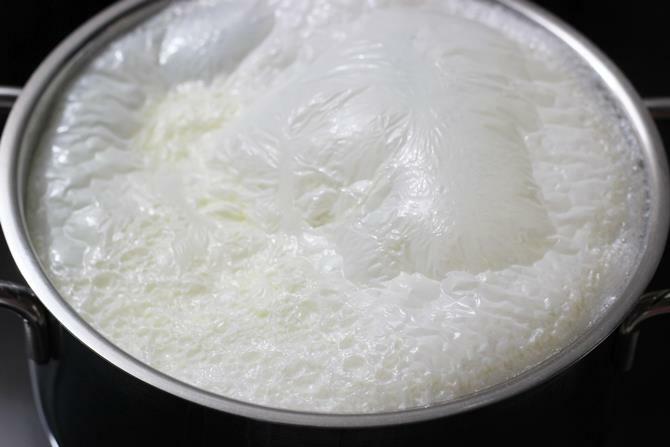 Can you tell me which brand milk you use to make paneer and if it is UHT carton milk or fresh milk whole fat? Hi..thanks for the recipe. I had a query that can we use low fat milk for preparation of sandesh? Yes you are right. I just finished making chena from 1 litre of double toned milk..and I hardly got 1 small bowl of it. But I think that will yield a low fat sandesh. Will low fat milk affect the final taste of this sweet? Taste may not be the same. Lovely clicks and ideas. Wonderfully explained. <br />Thanks for sharing.